For most of August and some of September the weather was miserable. Paper and books felt soggy to the touch and I had to move a bunch of clothing to our newly-acquired storage because it was mildewing on the closet. Then I noticed something horrifying – the back panel of our living room media console was covered with some sort of mold, inside and out! I vacuumed and cleaned it off with some sanitizing wipes. Less than a week later, the mold was back. That’s when I decided to make my own mold spray with essential oils and vinegar. So far, it’s worked better than the wipes I used before, which is pretty exciting! I really don’t want to have to pull the back panel off the media console and throw it away because that just seems silly. If you have a serious mold problem please call a mold removal specialist! Mold spores are naturally occurring in the air. Even if you get rid of mold on your furniture, as I have, it may come back later. Whenever the humidity rises, mold may make a comeback. From what I’ve read, 24-48 hours of humidity above about 60% is all the airborne spores need to take advantage of the situation! To help keep mold at bay, consider using a cold diffuser to diffuse for a day or two after your mold clean up, and again as needed. It’s very important to use a cold diffuser because heat can damage essential oils, making them ineffective. Consider using a blend of oils. Look below the recipe for some for some of the best essential oils for combating mold! This essential oil mold & mildew spray is not a magical unicorn. What I mean by that is that it’s pretty awesome, but there are some things it won’t work for. This spray only works as far as it can penetrate. It cannot get mold inside your walls or floorboards, for example, that it simply cannot access. Essential oils may not be able to tackle really huge mold problems. Again, please call a pro if needed! Please note that I photographed this with a clear bottle because it’s what I had on hadn’t when I needed it, but amber or cobalt blue bottles are much better for essential oil sprays. They keep light from degrading the oils. If you absolutely hate the smell of vinegar, you can dilute it, but your spray is far more likely to be effective if you don’t dilute the vinegar further. 5-10 drops of an additional oil like cinnamon, clove, lemon, orange, peppermint, or oregano for more mold-fighting power. Protective gear like a mask, gloves, and goggles. Optional but highly recommended! EDIT: I used to only use DoTerra oils for everything, but I’ve switched to NOW Foods oils for things like cleaning products when I can find a pure essential oil from them. Some of their oils are diluted, but they’re clearly marked, so just make sure to find the pure essential oil offerings and you’ll be okay! Pretty easy supply list, right? I needed full strength mold spray, but if you think the smell of uncut vinegar will be too much for you, you can use 1/2 cup vinegar and 1/2 cup distilled water. This is so simple – are you ready? 1. Combine all ingredients in the spray bottle. 2. Shake to combine before each use. I said it was easy! 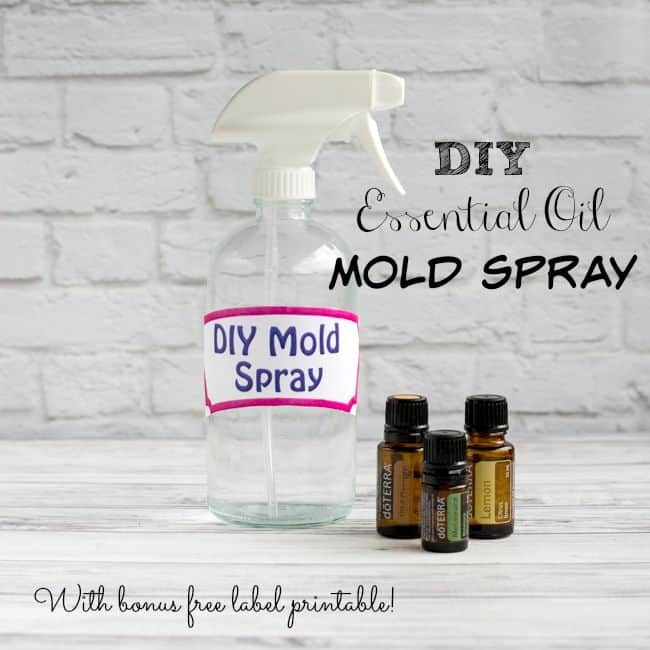 If you don’t want anyone being confused about what’s in your spray bottle, you can download, print, cut out, and adhere this DIY mold spray label free printable. 1. Spray the affected area with your mold spray and let it dry fully or for at least an hour. This allows the mold to absorb the vinegar and reach the membrane behind the fuzzy part. This membrane is the true, underlying source of the problem. 2. After an hour, spray again then wipe it down with a cloth or paper towels. Wiping down helps keep the mold spores from becoming airport. 3. Give the whole area another spray then allow it to dry completely. As a note, there are multiple high-quality essential oil companies out there, but not all essential oils are created equal. I’ve used rando/grocery store brands in the past that were obviously very diluted. I remember one bottle of lavender oil, in particular, that needed about 20 drops to actually smell the lavender in anything! I used to exclusively use DoTerra oils, as pictured here, but have also started using some of NOW Foods’s pure oils for cleaning products like this. Just make sure you’re using pure essential oils (no filler or fragrance oils!) and you should be fine. If you don’t have tea tree oil, there are others you can use. 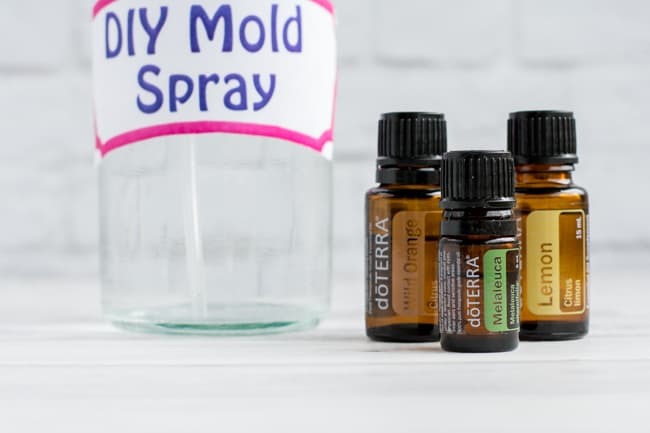 You can also add a few drops to boost your mold spray’s power. Oregano oil is an incredibly potent essential oil that can help sanitize your home. It may have anti-mold properties and studies have shown it can help eliminate germs. 1 Oregano oil is very “hot,” which means it can burn if topically applied undiluted. I personally wouldn’t use more than a few drops to avoid potential problems with breathing in sprayed oregano oil! Cinnamon oil may be effective at combating mold2 Again, it’s very potent so be careful! Clove oil is another powerful oil that may help with mold problems. 3 Just remember, if you have a black mold problem you really should call processionals! Peppermint, lemongrass, orange, and lemon may also kill mold/fungus and bacteria (source). What’s your favorite DIY cleaning product to make with essential oils? Please remember: These statements have not been evaluated by the Food and Drug Administration. This product is not intended to diagnose, treat, cure, or prevent disease. I’m just sharing what worked for me – please call the professionals if you need help! Sienkiewicz, M, et al. “[The Antibacterial Activity of Oregano Essential Oil (Origanum Heracleoticum L.) against Clinical Strains of Escherichia Coli and Pseudomonas Aeruginosa].” Current Neurology and Neuroscience Reports., U.S. National Library of Medicine, www.ncbi.nlm.nih.gov/pubmed/23484421. Gilling, D H, et al. “Antiviral Efficacy and Mechanisms of Action of Oregano Essential Oil and Its Primary Component Carvacrol against Murine Norovirus.” Current Neurology and Neuroscience Reports., U.S. National Library of Medicine, May 2014, www.ncbi.nlm.nih.gov/pubmed/24779581. Cvek, D, et al. “Growth Inhibition of Aspergillus Ochraceus ZMPBF 318 and Penicillium Expansum ZMPBF 565 by Four Essential Oils.” Current Neurology and Neuroscience Reports., U.S. National Library of Medicine, June 2010, www.ncbi.nlm.nih.gov/pubmed/20587393. Gupta, Charu, et al. “Comparison Of Antimicrobial Activities Of Clove Oil & Its Extract On Some Food Borne Microbes.” The Internet Journal of Health, Internet Scientific Publications, 31 Dec. 2008, ispub.com/IJMB/7/1/13649. Hello ! Getting ready to use your mold spray recipe ! Wanted to ask permission to share your blog post with my fb group ! My email is on the thing here ! Thanks I’m excited to have this work and i know I’ll sleep better tonight knowing my family is safe from mold ! I found some on my window ledge thing…when you open your Windows thatlittle ledge inside…so hopefully easy to clean !